Dining at the Cheesecake Factory can be torturous if you’re dieting, but if you stay away from the dessert portion of the menu, you can find healthy, low-calorie options. The wild mushroom soup, for instance, weighs in at fewer than 200 calories and includes ingredients that can improve digestion, lower your cholesterol, control your blood sugar levels and protect against some forms of cancer. The Cheesecake Factory wild mushroom soup contains portabello, shiitake and chanterelle mushrooms. Portabello mushrooms are meaty, shiitake mushrooms have an intense flavor and chanterelle mushrooms are fleshy and aromatic. Portabello mushrooms, low in fat and high in fiber, provide B vitamins, potassium and selenium. 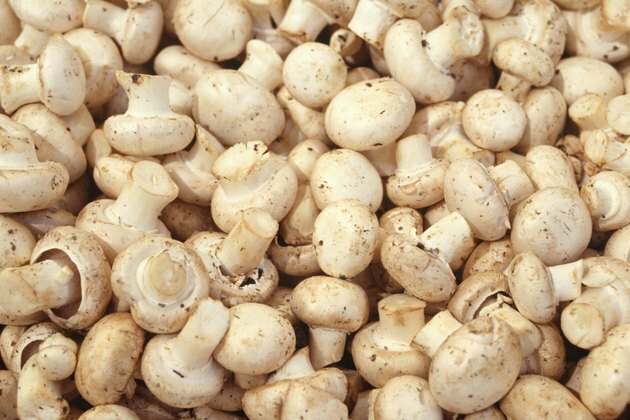 Two properties in portabello mushrooms–polysaccharide and beta glucan–also exhibit some anti-cancer properties, according to HealthCastle.com. Shiitake mushrooms, in dried form, contain nearly as much protein as veal and also provide niacin and riboflavin. They are low in calories–a full pound of fresh shiitake mushrooms contains 125 calories, according to GMushrooms.com. Chanterelle mushrooms, also low in calories, provide protein and fiber, according to Puritan.com. The chicken stock in the Cheesecake Factory wild mushroom soup provides a good source of protein. One cup of chicken stock contains 86 calories and 6 g protein, 2.9 g fat and 8.5 g carbohydrate, according to the U.S. Department of Agriculture's National Nutrient Database. Chicken stock contains magnesium, calcium, phosphorus, collagen, gelatin and glycine. Chicken stock, because it contains gelatin from chicken bones, may also help you better digest some foods, including milk, beans, meat, barley, oats and gluten. The onions in Cheesecake Factory wild mushroom soup contain a sulfur compound called allyl propyl disulfide, responsible for increasing insulin resistance and lowering blood sugar levels. The chromium and vitamin B6 in onions lower bad cholesterol, protecting against stroke and heart attacks. Onions may also protect against breast, prostate and ovarian cancer. An antioxidant in onions–quercitin–may protect your colon against cancer-causing substances and protect your bones against osteoporosis, according to an article by The New Zealand Herald. The garlic in Cheesecake Factory wild mushroom soup contains three sulphur compounds–sulfoxides, dithianes and thiosulfinates–that provide health benefits. Louis Pasteur, best known for providing a safe way to process milk, identified antiseptic properties of garlic in 1858. Ancient Romans used garlic to give them courage, and Hippocrates used it to treat cancer. Modern research suggests the selenium in garlic may lower the risk of developing some types of cancer, and that garlic may also reduce blood pressure and cholesterol. Other ingredients in Cheesecake Factory wild mushroom soup include celery, a source of apiin, a “super-nutrient” that may suppress your appetite; potatoes, a better source than bananas for potassium and a good source of B vitamins, and four additional flavorings: salt, pepper, sherry and Worcestershire sauce. The alcohol in the sherry would be removed during cooking. If you are allergic or sensitive to milk, a serving of wild mushroom soup contains about 1/2 ounce of light cream.